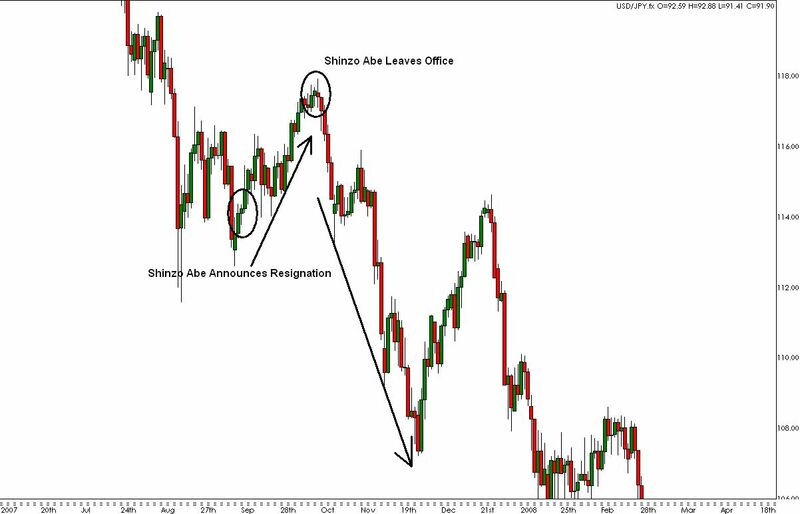 Japan announced a new Prime Minister this morning -- Naoto Kan. Hopefully he will have better luck than his 4 predecessors who resigned with only a year or less in service. 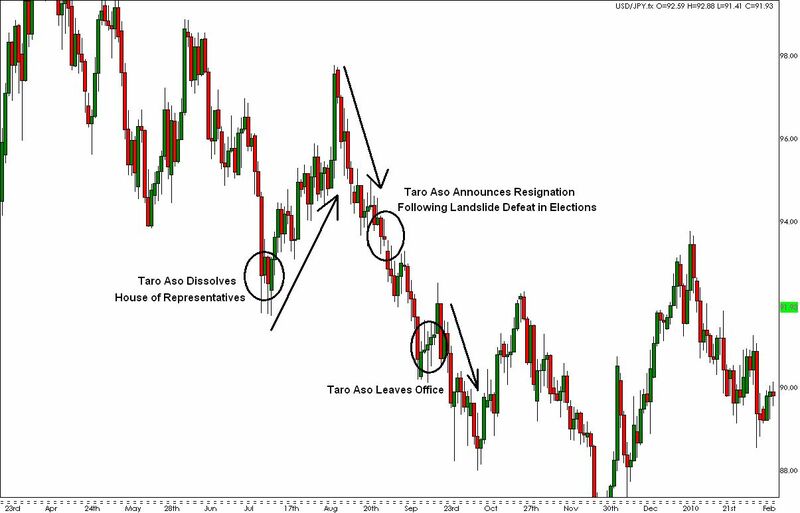 Resignations by Prime Ministers can have a significant impact on the country’s currency because its performance reflects investor sentiment. 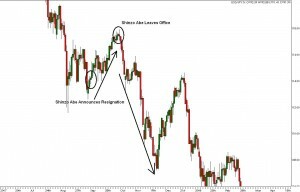 Forex traders typically do not like change and when Hatoyama announced his resignation, USD/JPY rose from 90.95 to 92.35 as the Yen as plummeted against the U.S. dollar. 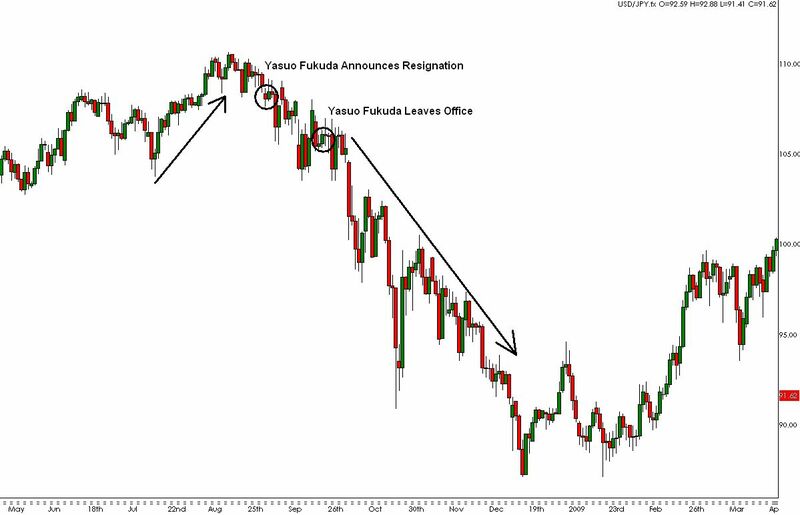 To get a sense of how the Yen could trade going forward, it is worthwhile to look back at how the currency behaved before and after the resignations of previous Prime Ministers. 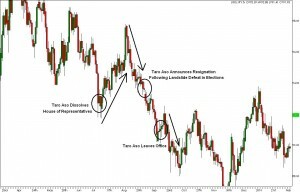 The following charts suggest that the recent gains in USD/JPY may be temporary because once the political uncertainty from the Prime Minister’s resignation subsides, USD/JPY usually resumes it slide. Hopefully the new Prime Minster, Naoto Kan can break the unlucky chain and hold onto the post for more than a year. Very true. The effects of Political uncertainties are very short term in nature.